He now had the product, but it needed a name. He new the name had to be original, colorful, distinctive, and descriptive. After much work, he originated the name Arab (pronounced A' rab) a term derived, in this case, from the theme of the Arabian Nights. The new label had a certain romantic flair, giving illusions of flying Persian carpets and still other mysteries of the East. From that day forward, people have been intrigued by the name while at the same time realizing that it truly is a standard of excellence. 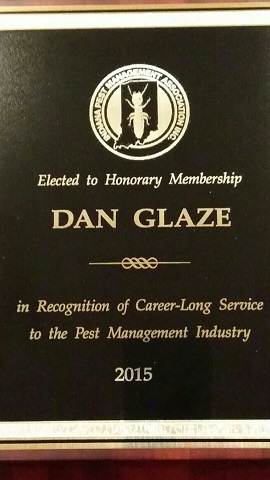 xxxxxxxxxxxxxxxxxxxxxxxxxxxxxxxxxxxxxxxxxxxxxxxxxxxxxxxxxxx On January 13th, 2015, Dan Glaze Sr. was presented the "Lifetime Membership" award from the Indiana Pest Management Association. We are truly blessed to have him with us. 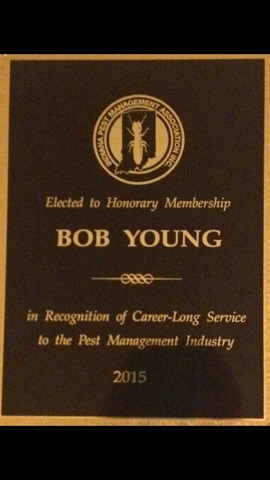 On January 13th, 2015, Bob Young was honored to receive the career long service award from IPMA. 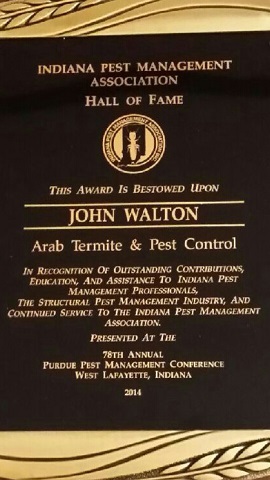 He valued the friendships and pest control knowledge he received from being a member of such a fine organization.